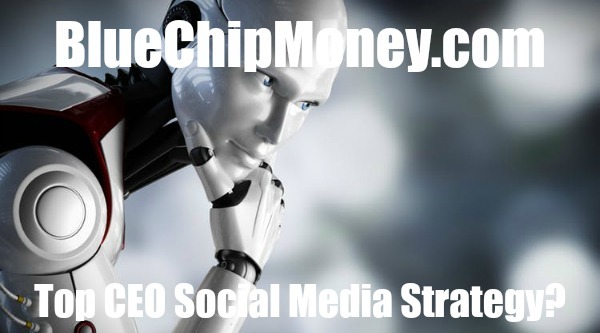 Millennium 7 Publishing Co.: Top CEO Social Media Strategy? Top CEO Social Media Strategy? Many CEOs turn their noses up at the thought of using their personal social media accounts to help their companies’ brands. With everything else on their plates they view social media as a distraction. In fact, 61% of Fortune 500 CEOs have no presence on social media at all. They prefer to lead from behind the close doors of their office. His dedication to Twitter not only has other CEOs in the wireless space beat, but his personal account is ahead of the corporate accounts many of T-Mobile’s largest competitors as well. Legere has 5.42 million followers on Twitter. Compare that to T-Mobile’s biggest rival Verizon which has 1.47 million followers on its verified company page. As a note, several weeks ago I wrote about the rash of phony follower purchases by celebrities and other whose accounts boast massive followings, many of whom were recently called out in a New York Times exposé. To that end, I followed the advice I presented and looked up Legere’s Twitter following on TwitterAudit.com. His score: 77% authentic, meaning 4.15 million authenticated followers, which is high enough to support a reputation of real. “The reason I know they won’t be able to take advantage of what I do is that there’s no f––ing way they’re going to be able to spend their day doing what I do,” he said. “I wake up in bed, and I do Twitter for an hour and a half just to catch up,” Legere said in an interview with GeekWire. He tweets about Batman, sharing viral videos, and, of course, why T-Mobile is the cell phone carrier to choose. It is a fun and well-laid out tactic that gets him progressively more followers. Ibrahim Al-Haidos Founder of FURSAN luxury handbags has a large social media presence. His platform of choice is Instagram, where he has more than 161,000 followers. He posts every three to four days, but posts are rarely about his company. Odd? Not at all, as consumers like and comment on photos that show him behind the scenes, enjoying life and living the lifestyle that his company’s brand image projects. Many of his photos show him enjoying the architecture and desert landscape of his home country, Qatar. Some of the most-commented posts are of his family on their travels together. Al-Haidos uses Instagram to create a personal connection with customers that creates brand loyalty. Warren Buffet joined Twitter in April 2013. Since then, he has tweeted a total of nine times and has 1.37 million followers. The 87-year-old’s sense of humor shined through from his first post, “Warren is in the house.” In another, he showcased his like for the show Breaking Bad with a selfie of himself as Walt White. These days Buffet doesn’t tweet at all, yet his following continues to grow. He is a CEO to follow simply in support of his success and the sound advice he gives elsewhere. CEOs don’t have to spend untold hours on social media pushing people to buy their brand. But the ones who are doing social media best are creating buzz within their communities and connecting with customers—always a plus. There are more than 5 million people who know that T-Mobile’s CEO, John Legere, is on Twitter. Does anyone know if AT&T and Verizon’s CEOs are on Twitter? It appears not.. Guest Authored By Cheryl Conner. Cheryl is Forbes Contributor, Entrepreneur, Communications expert and founder of SnappConner PR. She's the author of Beyond PR communicate Like A Champ In The Digital Age. She is co-creator of Content University, which helps entrepreneurs and executives learn to write and to tell their stories better, and how to use their strong thought leadership content to advance their companies. Follow Cheryl on Twitter. "CEOs don’t have to spend untold hours on social media pushing people to buy their brand. But the ones who are doing social media best are creating buzz within their communities and connecting with customers.